If you are tired of nibbling on rice cakes, consider trying Oh! 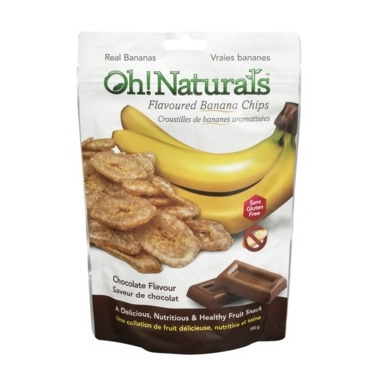 Naturals Banana Chips. Crunchy and delicious snacks! Oh! Naturals Banana Chips are made from the Chuoi Xiem banana which is grown in Vietnam. This is a non plantation variety common throughout that country and considered to be among the sweetest and most flavourful. The chips are processed in their facility in Vietnam under strict ISO 9000 and HACCP quality assurance guidelines. The process is called Vacuum frying and produces a chip that has 1/2 of the fat found in other banana chips. They're more tart in a way than regular banana chips which I don't really like. Maybe it's just because I'm used to the ones with coconut oil and more sugar. I might try the strawberry ones next time and see how I like those. These banana chips are actually good for you! Not like most banana chips that are loaded with saturated fats (coconut oils. etc). This brand comes across with more of a freeze dried texture, and is low in fats and calories. Definitely my go to banana chip from now on. The flavors are great, subtle but still noticeable. These are good... not the best. Very small banana pieces. I would rather buy the dried out banana flakes from bulk barn. Would I buy these again? No.